The beautiful landscape scene usually fades when the sun sets. But don't let this happen. 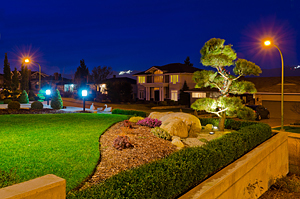 Continue to experience the amazing beauty of the landscaped area even at night with the use of landscape lighting. But there is more to installing landscape lighting than just improving the beauty of the outdoors at night. Special landscape lights are categorized into accent lights, deck or rail lights, flood lights, hanging lights, path lights, and pond lights. Imagine the limitless possibilities. Creating a brand new landscape scene at night will be a magical reality. Landscape lighting also extends the functionality of outdoor living spaces. In fact, gazebos, patios, fireplaces, and even the outdoor kitchen and BBQ can become a different party venue at night with these lights. Not to mention that installing lights around the house will keep away stray animals and burglars, thus boosting the security level of the home. Using low voltage lighting systems provide the basic benefits of landscape lights and more. The name says it all. Such systems use low-voltage lights. While the typical garden lights run on 120 volts, low-voltage lights need only 12 volts. With low voltage lighting systems, homeowners are assured of safety and great savings. Low voltage lighting systems use only 10% of the total consumption that the typical garden lighting uses. Therefore, there will be a lot less electricity consumption, thus a lot less cost on power bills. This is not only economical, but also environmentally friendly. And since the lights are only 12V, the bulbs produce less heat and are less likely to cause short circuits. Typical garden lights heat up fast, making them potential fire hazards. Though low-voltage lights are believed to emit low beams, which is not so great for certain applications, you shouldn't worry. Contrary to this popular belief, low voltage lighting systems can actually emit even brighter lights. That is, if the right lights and correct transformer were used. And that's possible with a pro's help. Many believe that low-voltage lights are easy to install even by the most novice DIY homeowner. Although that could be true, still nothing beats the professional's touch. Professionals in Landscape Magic are not only skilled and educated at doing this. We got the experience that beats all of our competitors. 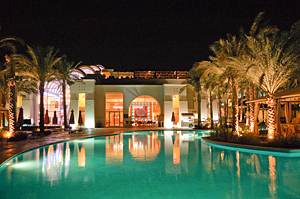 We can help you plan the best nightscape effect using the low voltage lighting systems. Our expertise has not only helped Sedona, but also other Arizona areas like Happy Jack, Camp Verde, Cottonwood, and Village of Oak Creek. Our team has long been living in the area. That gives us the advantage of knowing what's the trend in the region as well as what are the best lights for any landscape in the state. Besides creativity, we also install low voltage lighting systems with safety in mind. Our men are certified and trained by industry organizations. Rest assured that we can build whatever landscape lighting you want without compromising safety. So, if you want to make your landscape more secure, and you want to improve its aesthetic appeal with the use of outdoor lights, give us a call. Only Landscape Magic can create a magical yet safe experience right in your yard with our low voltage lighting systems.